The crew from Larklight is back in this delightfully unusual fantasy novel. In Larklight, we discovered a world set in the Victorian era but with space travel. Imperialism isn't limited to Earth... England and other countries have branched out into space, putting colonies on different planets with mixed success. Great ships fly through the aether and one of these ships is Larklight, home to Art and Myrtle Mumby and their parents. In Starcross, the Mumby's have decided to go on holiday. After receiving an appealing ad for a beachside hotel called Starcross, they depart at once, but upon their arrival they discover several strange things. First of all, there is no beach (although they are assured that the sea will reappear when the tide's in). Secondly, Art finds a strange black creature floating outside his room and all it says is "Moob!" And then they discover that Jack Havock, Art's pirate friend, is staying at the hotel, but under a different name. Strange things are happening at Starcross, that's for sure. And soon enough all the Mumby's are caught up in another adventure across space. I think I liked this one even better than Larklight (and that's saying a lot because I thoroughly enjoyed Larklight). My coworker J pointed out that we get familiar with the world in Larklight, so when we get to Starcross, we already know how the world works and can get straight to the adventure. It certainly is a non-stop adventure and the beautiful and humorous illustrations by David Wyatt add so much! 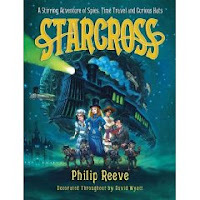 Larklight and Starcross are great books for young fantasy fans who seem to have read everything the genre has to offer. They're unusual, funny, and action-packed. Also, keep your eyes peeled for Mothstorm, the third book in the series due out in October.